Directed by Mikael Håfström, Stallone stars as security specialist Ray Breslin, whose job it is to test the reliability of prisons by breaking out of them. When he’s sent to a new high-tech facility called ‘The Tomb’ (the movie’s original title), he soon realises he’s been double-crossed. Now wrongfully imprisoned, he must recruit fellow inmate Emil Rottmayer (Schwarzenegger) if he is to break out. Early on, there’s an element of smarts to the narrative that distinguishes it from similar fare, with a well-staged prison break giving us a first-hand view of Breslin’s talent for finding weaknesses in prison defences. Ultimately though the innovation level is at a minimum, and once Stallone is unceremoniously thrown in prison, Escape Plan settles into a familiar groove. Miles Chapman and Jason Keller’s screenplay wisely ditches the self-awareness inherent in The Last Stand and (to a lesser extent) Bullet to the Head, but whilst the unfolding drama in prison is compelling enough, other plot elements could do with much more tightening. Breslin’s back story should be far better-defined for such an important piece of information, whilst his security team – which comprises of Amy Ryan and Curtis ’50 Cent’ Jackson – grow more and more superfluous as proceedings escalate. Thankfully the bulk of the action takes place in ‘The Tomb’, and when our two protagonists are playing off one another Escape Plan is at its immensely enjoyable best. Schwarzenegger in particular looks more alive on screen than he has been in years, adding spark to a lacklustre middle act in what is a playful performance. In contrast Stallone seems to be having less fun, but if there is an art to playing the straight guy, the Italian Stallion perfected it many films ago. Additionally, Håfström is smart enough to give his stars moments which are guaranteed to put a smile on any fan’s face, from a prison showdown (“You hit like a vegetarian!” going straight into 2013’s best lines) to the Governator wielding a BFG in the exciting final act. The supporting cast is strong too; Jim Cavaziel is suitably antagonistic as the sharply dressed warden, whilst a subplot involving a Muslim prisoner manages to be surprisingly effective largely due to a well-acted turn from Iron Man alumni Faran Tahir. 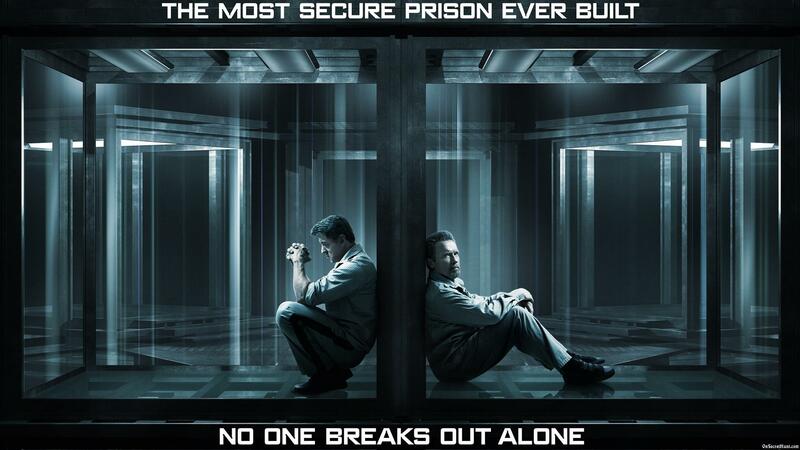 Escape Plan doesn’t reinvent the wheel – indeed, Stallone has broken out of prison four times in his previous movies – but thanks to the likeability of its two leads it’s a thoroughly enjoyable slice of action cinema. It’s a shame it took these guys 30 years to team-up. Better late than never though. Escape Plan is released on DVD and Blu-ray on March 17th.